This will install Gnocchi with the dependencies for the S3 and PostgreSQL drivers and the command-line interface to talk with Gnocchi. Since you need a SQL database for the indexer, the easiest way to get started is to create a database on Amazon RDS. 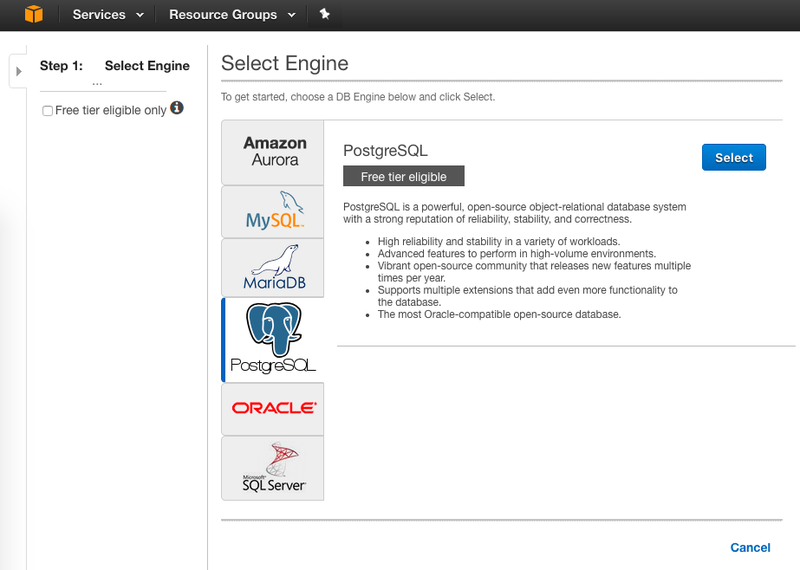 You can create a managed PostgreSQL database instance in just a few clicks. You can then configure your PostgreSQL instance: I've picked a dev/test instance with the basic options available within the RDS Free Tier, but you can pick whatever you think is needed for your production use. Set a username and a password and note them for later: we'll need them to configure Gnocchi. The next step is to configure the database in details. Just set the database name to "gnocchi" and leave the other options to their default values (I'm lazy). 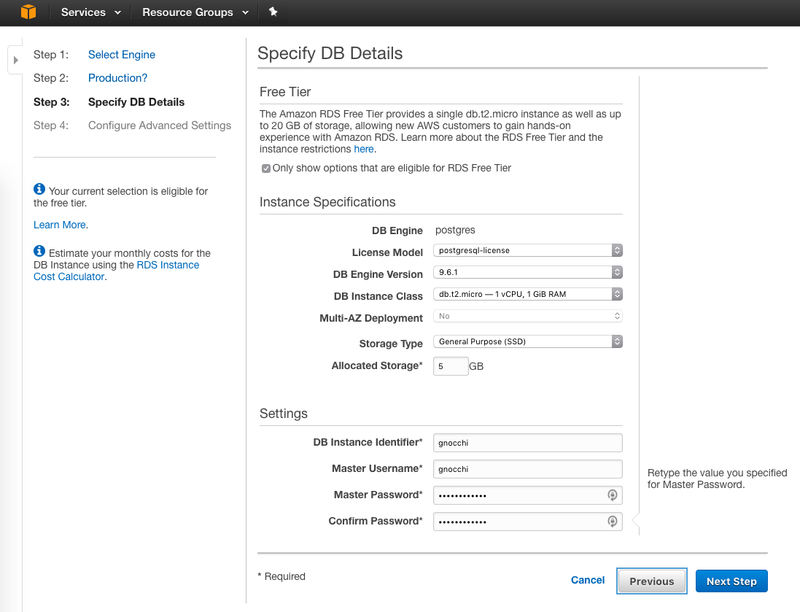 After a few minutes, your instance should be created and running. Note down the endpoint. 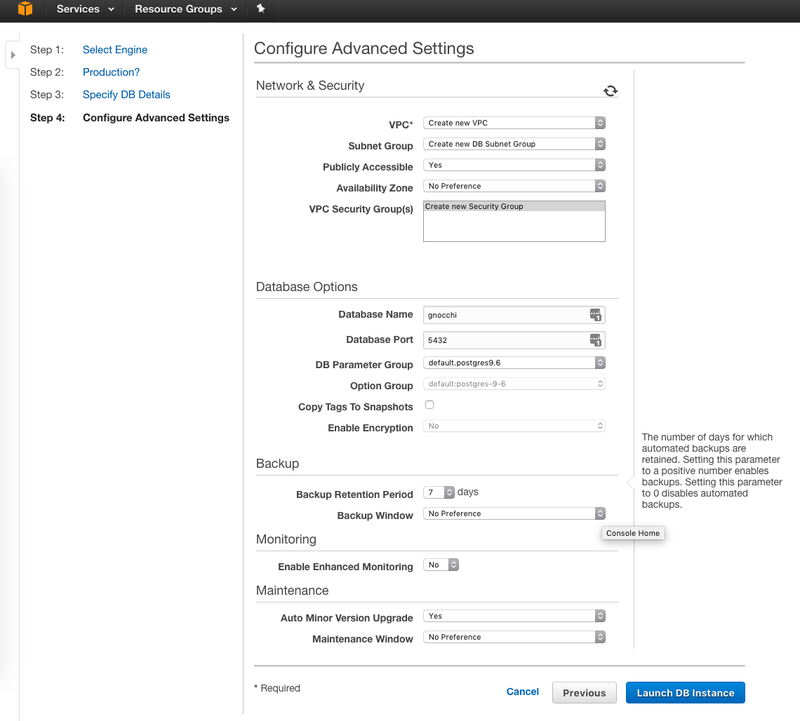 In this case, my instance is gnocchi.cywagbaxpert.us-east-1.rds.amazonaws.com. In order to give Gnocchi an access to S3, you need to create access keys. 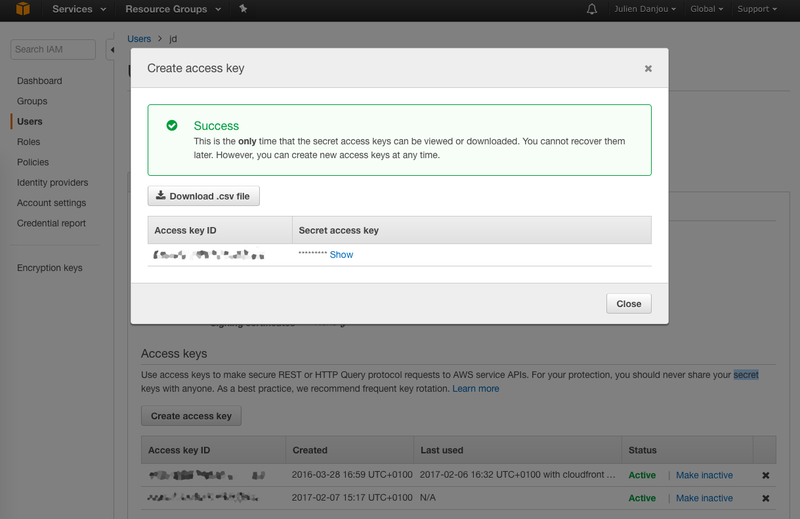 The easiest way to create them is to go to IAM in your AWS console, pick a user with S3 access and click on the big gray button named "Create access key". Once you do that, you'll get the access key id and secret access key. Note them down, we will need these later. Now is time to create the gnocchi.conf file. You can place it in /etc/gnocchi if you want to deploy it system-wide, or in any other directory and add the --config-file option to each Gnocchi command..
storage.s3_endpoint_url: the S3 endpoint URL – that depends on the region you want to use and they are listed here. storage.s3_region_name: the S3 region name matching the endpoint you picked. 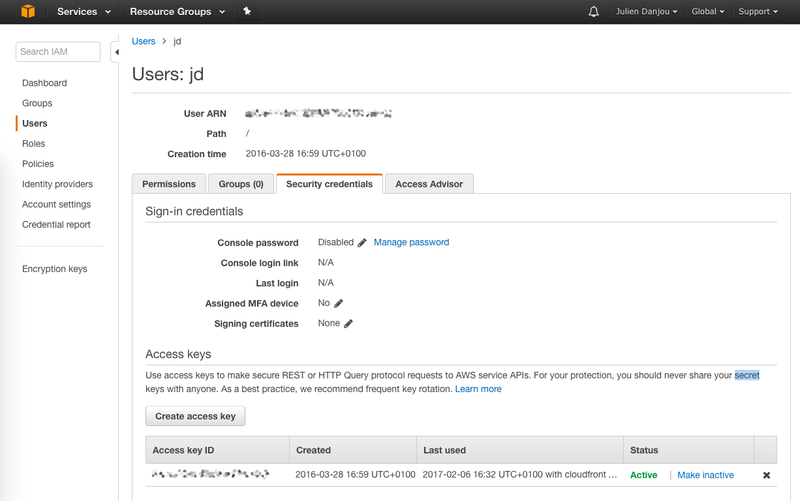 storage.s3_access_key_id and storage.s3_secret_acess_key: your AWS access key id and secret access key. The best way to run Gnocchi API is to use uwsgi as documented, but in this case, using the testing daemon gnocchi-api is good enough. 2017-02-07 15:52:41.416 6262 INFO gnocchi.cli [-] 0 measurements bundles across 0 metrics wait to be processed. Once everything is running, you can use Gnocchi's client to query it and check that everything is OK. The backlog should be empty at this stage, obviously. Gnocchi is ready to be used! $ # Create a generic resource "foobar" with a metric named "visitor"
And voilà! You're ready to store millions of metrics and measures on your Amazon Web Services cloud platform. I hope you'll enjoy it and feel free to ask any question in the comment section or by reaching me directly!